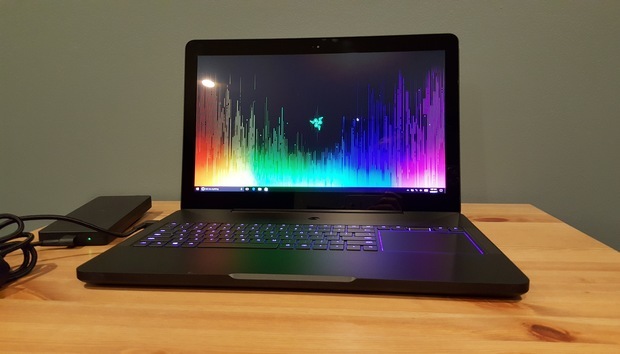 Late last year Razer resurrected its Blade Pro laptop line, finally stuffing it with hardware worthy of the “Pro” appellation. Our three-word review: We loved it. It’s a great machine, if you can afford it. And now it’s a bit better, thanks to the standard year-over-year refresh. Razer released details on a new Blade Pro today—it’s keeping Nvidia’s GeForce GTX 1080, but moving over from an Intel i7-6700HQ at 2.6GHz to an overclockable i7-7820HK processor at 2.9GHz. The Blade Pro’s 32GB of RAM also gets a timing bump up to 2,667MHz (from 2,133MHz). It’s worth noting that only the headphone jack is THX-certified, not the built-in speakers—an important point, I think, given people usually associate THX with surround sound systems. While the Blade Pro’s speakers are certainly better than your average laptop's, they’re still not amazing by any means. We could also debate all day about the usefulness of THX certification. Is your non-certified Blade Pro from six months ago suddenly a decrepit old hag? Not at all. Razer’s even using the same 4K IGZO display on this new THX-certified laptop as it did on the 2016 model—just calibrated slightly differently, and with (presumably) a big ol’ THX stamp on the box. So yeah, this is a bit of a marketing win more than anything else. On the other hand it does prove the Blade Pro is one hell of a laptop. A THX representative confirmed to me that competing laptops have undergone testing, but Razer’s is the first to meet the standards of this new Mobile Certification program. That makes it somewhat-objectively the best laptop in the world for the moment, at least by THX’s standards—meaning as far as the display and headphone jack are concerned. Is that useful? I don’t know. The display is certainly an important aspect with laptops, so THX Mobile Certification isn’t a wholly made-up honorific. Still, it does seem of limited use to tech nerds—no consideration given to internal hardware, benchmarks, or anything we usually use to compare laptops. The Blade Pro is THX-certified to be easy on the eyes, and that’s about it. I guess you’ll have to keep reading our PCWorld reviews for the full picture. The good news in this case is we agree with THX: The Blade Pro is one of the finest laptops available, provided you’ve got $4,000 burning a hole in your pocket. Look for the updated Kaby Lake model in April on Razer’s website, and be sure to brag to all your friends about that THX Mobile Certification. They’ll love hearing about it.